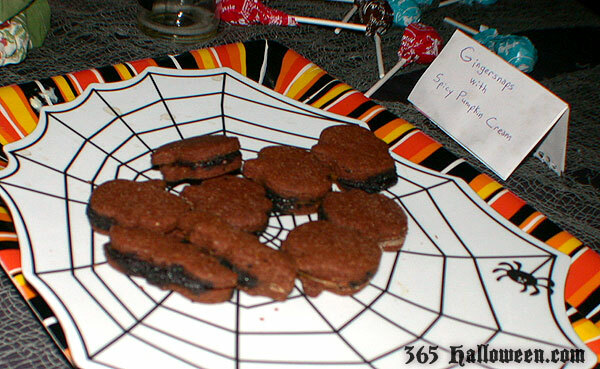 Like Leap Years, really delicious Halloween cookie recipes don’t materialize very often. As fans of the unusual, we decided to pair these 2 phenomenons together. Thus, we present to you the recipe for the crowd favorite dessert from last year’s Halloween party: Ginger Cookies with Spicy Pumpkin Cream Filling. They were a huge hit and were quickly devoured by guests. There are 2 options for preparing these Halloween cookies, based on how quick/easy you want them to be or how much sugar you want in them. The cookies are low sugar and can be eaten alone (as a drop or cut out cookie), but the addition of a spicy cream filling and black sugar topping can transform them into super sweet confections. We love them both ways, and you probably will, too. Mix dry and wet ingredients separately then add together to form a thick, soft dough. Refrigerate for 20 minutes. Lightly grease cookie sheet with margarine. For cut out cookies, shape dough into 2 large balls and roll out on floured surface for cutting out. 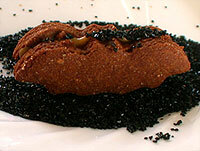 For drop cookies, roll into small balls and flatten with the bottom of a greased glass. 1/4″ thickness will produce crispy texture, and thicker cookies will be softer. If desired, sprinkle lightly with sugar before baking. Bake at 350F for 10 minutes. While these are baking, you can make your spicy cream filling. Either use a pastry bag or drop spoonfuls of filling in-between the cookies. 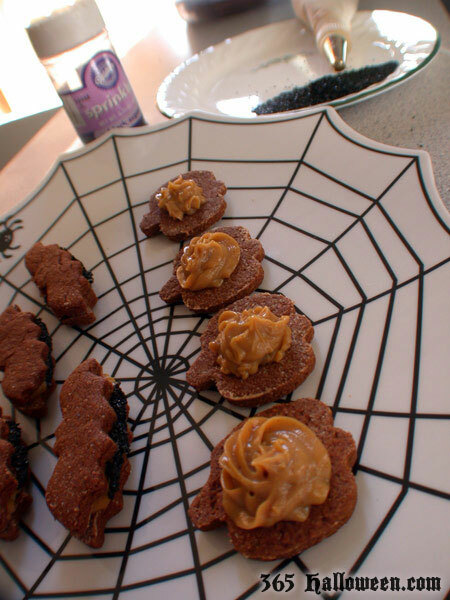 Optionally, you can dip the finished sandwich cookies in black sugar (which is plentiful around October) for an extra Halloween-y look. The “cream” thickens as it cools, so if you must refrigerate before piping it onto your cookies, let it warm up first or give it another whirl in your food processor. Rinse and wrap tofu in cheesecloth or lint-free kitchen towel and drain it for a few hours. You can cut this time down to about 5 minutes by wrapping, then just squeezing the tofu. You want to reduce it down to 1 cup. This step is important to encourage a thick texture and reduce the soy taste. In food processor or blender, whiz up the tofu until it is velvety smooth. If you are using cashews (instead of cashew butter) add those now and whiz again until smooth. Add the rest of the ingredients except the cornstarch/water mixture, and mix it again until smooth. Mix up the cornstarch and water and set aside. Transfer the pumpkin cream to a saucepan and heat on low just until it’s warm. Stir in the cornstarch/water mix and stir constantly until the mixture starts to get thick, about 5 minutes. Even if you mixed really well during this last phase, you will probably have a few tiny chunks. You have 2 options. Ignore them and your recipe is done! Or, if you are going to use a pastry bag to pipe this out then you should put it all back into the blender or food processor and whiz it up smooth again. Even itty bitty chunks can clog a small pastry tip. Then again, you could use a large pastry tip. Let cool completely and watch it turn all custard-y. Here’s a little proof from the party: about half way through the night there were only 9 cookies left from the 2 gigantic trays that we bought. Chow down! Let us know what you think of this recipe, and if you make your own we’d love to see pictures! 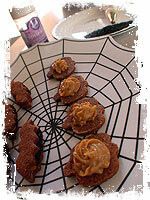 create your own Spicy Sandwich Halloween Cookie Recipe. 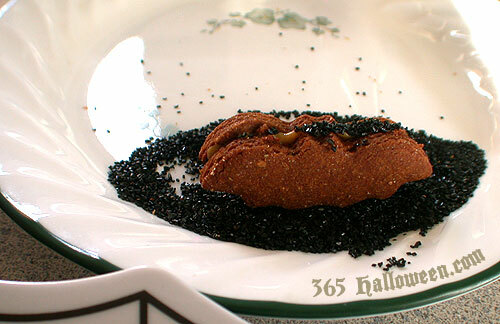 Subscribe to comments with RSS or TrackBack to 'Spicy Sandwich Halloween Cookie Recipe'. how many does this recipe make? how many finished, filled sandwiches? 365 Halloween Response: The final count is going to depend on what size and shape cookie cutters you are using (and how much dough you’re eating while baking, if you’re a cookie freak like us). A good rule of thumb is always see how much flour a recipe calls for. This one calls for 3 cups and when you compare that with any other cookie recipe, you’ll see that’s between 2-4 dozen. I think we got almost 3 dozen finished sandwich cookies.